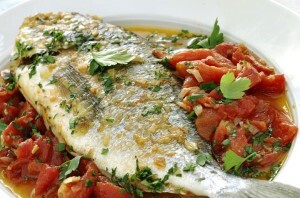 Acqua Pazza: Acqua Pazza (lit. crazy water in Italian) is used in Italian cuisine to refer to a recipe for poached white fish, or to simply refer to the lightly herbed broth used to poach it. There are many different variations of this sauce, from light broths, to thick tomato based sauces, which have been found on all types of seafood (not just the traditional white fish), and even chicken. While the dish Acqua Pazzaoriginated from fishermen of the Neapolitan area, who would sauté the catch of the day in seawater together with tomatoes and extra virgin olive oil, the term itself most likely originated from Tuscany. Heat 1 tbsp olive oil in a large pan on low–medium heat. Fry the chopped onion for 2 minutes or until translucent. Fry the 1 tbsp chopped garlic for 1 minute or until fragrant, but not brown. Add on the chopped scallions and mushrooms to the pan. Stir fry the mushrooms till the water is evaporated. Remove the contents of the pan in a bowl. Heat 1 tbsp olive oil in the same pan over low-medium heat. Add the chopped tomatoes to the pan. Fry for a further minute. Add the chopped red chili to the pan. Pour in 375 ml water to the pan. Note: If you are using canned/preserved black olives instead of fresh olives, you have to season accordingly, as the canned/preserved black olives are very salty. If possible, please wash them under running water before adding them to the Acqua Pazza. Season the broth with salt and pepper. Stir remaining 60 ml oil and torn basil leaves into the broth. Poach the fish fillets in the broth in a covered frying pan over low heat for 20 minutes or until just cooked. Add in the stir fried mushroom, onions and scallions from the bowl. Cook on medium heat for 2 minutes. Acqua Pazza is ready to be served. Garnish the Acqua Pazza with fresh pitted black olives.